We'll keep you updated on what's happening with motorcycle safety and motorcycle classes in the new year as we find out. 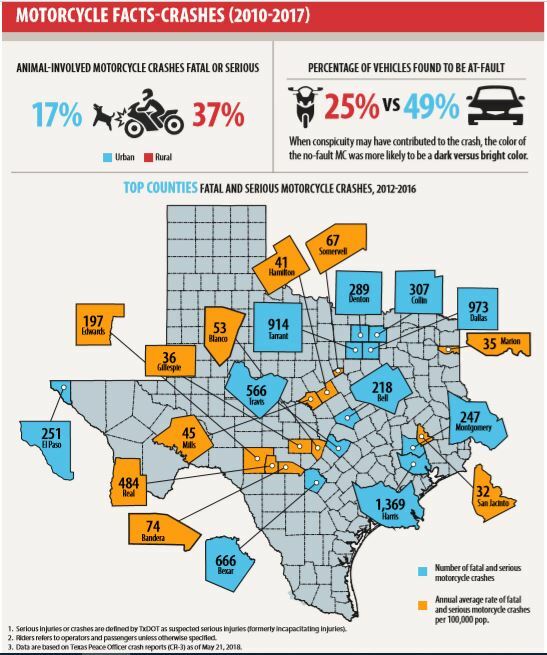 - Coming in January, the state is hosting the motorcycle safety conference for sponsors and instructors, and we expect to find out more details about the many changes coming to the program in 2019 following this year's Sunset Commission review and subsequent recommendation that the DPS Motorcycle Safety Unit not continue in its present form. - Expect to see changes in pricing. State price caps may be eliminated and loaner motorcycles and state-provided assistance with ecourse tuitions and books will go away. Providers will face a lot of additional expense...suddenly. thanks for lead on that website, I found this graphic interesting. . I would not have initially thought that animals were such a larger part of the fatal / serious crashes. I can generally figure out how to be safe around cars but not sure what to do about animals though.. other than slow down, avoid driving all together at dusk / night... Open to any suggestions. Also interesting to see cars at fault 50% of the time in motorcycle crashes. That's a pretty big factor and tells what we all know, that car drivers need better training, not just motorcyclists. So that got me thinking that its been nearly a decade since M licensees have required MSF (2009), and I was wondering if that had any noticeable impact on the crash data on TxDot website given its been long enough to maybe see some change. In short the number of fatal crashes is essentially the same, actually slightly higher, than it was 2009 despite the # of registered bikes being significantly fewer, 360K vs 425k. So initial pass seems unclear, but hard to say because will not know from this data if the people who crashed had M licenses or not, or if it would have made any difference given the circumstances, particularly if animals at play. Don't get me wrong not suggesting against MSF, quite the opposite. I did find interesting that fatal car crashes were on the decline up to about 7-8 yrs ago, even with increasing # of vehicles on road. Then from about 2012 on they started to rise steadily again. I suspect this is about the time critical mass of cell phone / texting / message reading / while driving turned around what was an impressive positive trend. Below is snip of couple charts I made. Just in case you'd find them interesting. The problem is that even before 2009, 98.5% of the people that went to get their Class M were already taking the class even though it wasn't mandatory. A change of 1.5% isn't enough to show anything of value. True. But remember that the reason they took the class was to exempt them from an on-the-bike skills test, which was inconvenient and difficult to schedule. Since 2009 the curriculum has changed, but we still have limited data available. Matching the CRIS data with the class data from REMS has been talked about for years, but it's never been done. That would give us some idea of training levels for those involved in crashes. The basic ridercourse is the elementary school level training of motorcycling. It's the equivalent of someone passing the 8th grade and assuming they're set for a career in astrophysics. Advanced training on an ongoing basis has been shown to have a positive impact on crash incidence. The question is: what does it take to convince folks that it's more fun to ride when you know what you're doing? Use the link above to learn the latest from state govt on where the Motorcycle Safety Program is at this point. We won't know for sure what's happening for awhile yet. Once you click on the link, scroll down to Dept. of Public Safety. Once there, scroll down to Motorcycle Safety.